The Grand-Place testifies in particular to the success of Brussels, a mercantile city of northern Europe that, at the height of its prosperity, rose from the terrible bombardment inflicted by the troops of Louis XIV in 1695. Destroyed in three days, the heart of the medieval city underwent a rebuilding campaign conducted under the supervision of the City Magistrate, which was spectacular not only by the speed of its implementation but also by its ornamental wealth and architectural coherence. Today the Grand-Place remains the faithful reflection of the square destroyed by the French artillery and testifies to the symbolic intentions of the power and pride of the Brussels bourgeois who chose to restore their city to its former glory rather than rebuild in a contemporary style, a trend commonly observed elsewhere. A pinnacle of Brabant Gothic, the Hôtel de Ville (City Hall), accentuated by its bell tower, is the most famous landmark of the Grand-Place. Built in the early 15th century, the building partially escaped bombardments and underwent several transformations over time. Its ornamental program is largely due to the restoration campaigns conducted in the late 19th century. Facing it, the King’s House, rebuilt in the historicist vein, is perfectly integrated into the ensemble. Its elevation is in keeping with the Gothic style edifice prior to the bombardment and testifies remarkably to the ideals of the contextual conservation of monuments advocated in the 19th century. The King’s House has been occupied for decades by the City Museum. On both sides of these monuments symbolic of public authority were houses occupied by powerful corporations. Each different but built over a very short time, they illustrate remarkably the Baroque architecture of the late 17th century, with a singular treatment of the gables and decorations, sometimes fretted, sometimes more classical. Each house has a name and specific attributes, heightened with gold, reminiscent of the status of its occupants. It is interesting to note that this is a rare example of a square without a church or any other place of worship, which emphasizes its mercantile and administrative nature. La Grand Place is the focal point of Brussels. It is within walking distance of most major attractions in the old town, including the Manikin Pis. La Grand-Place, Brussels, also known as the Grand Place, is a UNESCO World Heritage Site in Belgium that was inscribed in 1998. 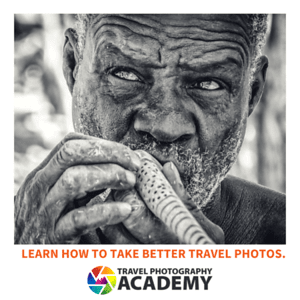 It is located in the central square of Brussels, Belgium and surrounded by many notable structures including the Town Hall of the city, Breadhouse (where the Museum of the city of Brussels is located), and many other edifices and guildhalls. The square where La Grand-Place, Brussels is located in is one of the major tourist destinations in the country. In fact, it is a memorable landmark in the city. The buildings that surround this area were mostly built in the late 17th century. The architectural details of these buildings, not just the Grand Palace, depict the cultural and social life of the era when it was built in. The history of La Grand-Place, Brussels date back to the 10th century during the reign of Duke Charles of Lower Lorraine. He constructed a fort in Saint-Gery Island until an open-air marketplace was established near the fort in the 11th century. From then on, the market developed and became the center of commercial development in Brussels. By the 13th century, there were indoor markets that were built on the edge of this open-air marketplace. In the 14th century, improvements were made to the Grand Place. This facilitated in the development of the local merchants and tradesmen in the area. The Duke was also short on money at this point forcing him to transfer control of the Grand Place to the local authorities. By the mid-15th century, the City Hall was constructed and served as the seat of the municipal tower. This only fueled the development within the iconic square, allowing more merchants to come into the area. 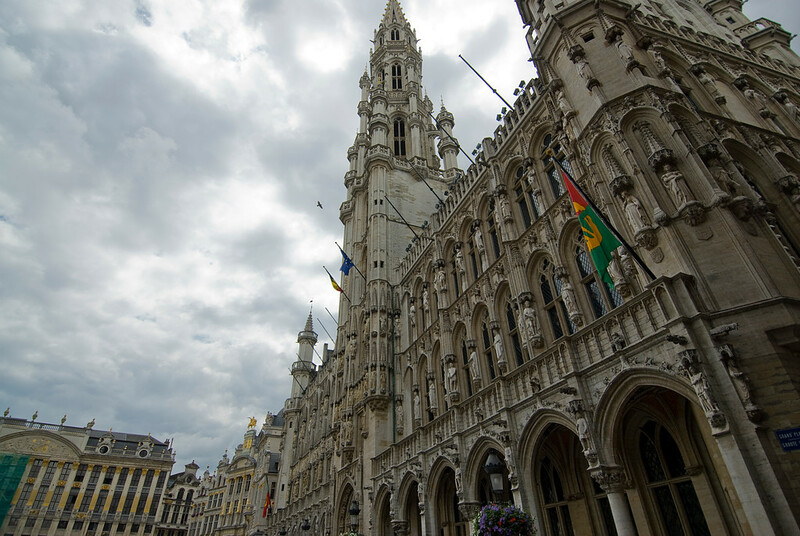 The historic value of the La Grand-Place, Brussels is evidenced by its status as the mercantile city of Northern Europe. It reflected a time wherein the city reached the peak of its prosperity. 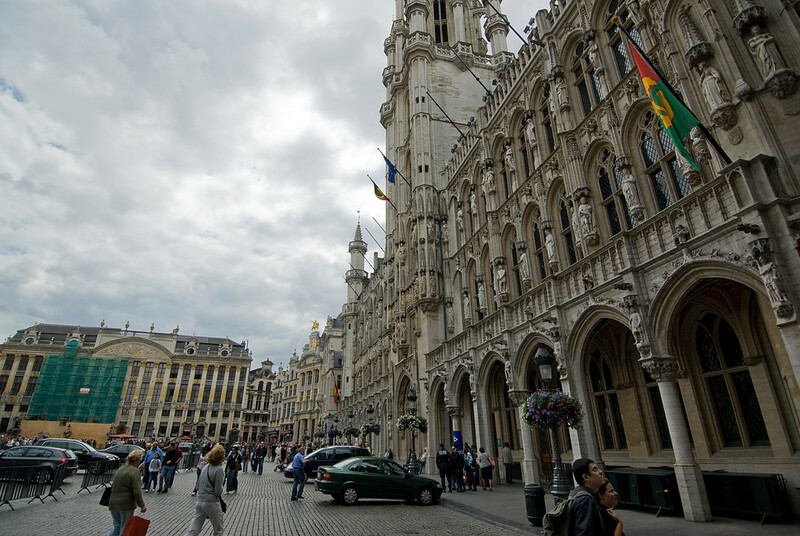 Town Hall: There is a row of guild houses and halls that line one end of the Grand Place in Brussels, Belgium. These buildings feature elaborately crafted architectural façade of Gothic, Baroque and Renaissance styles. These buildings give this iconic square the reputation as one of the most picturesque and well preserved medieval squares in Europe. 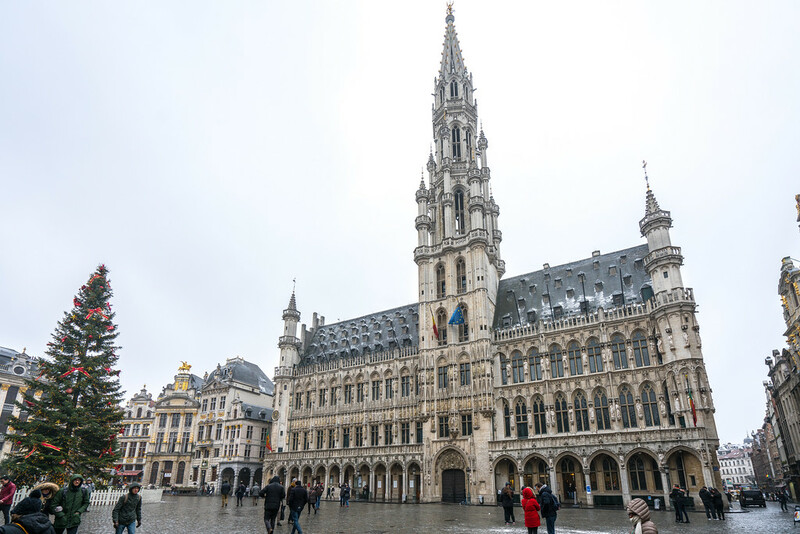 Guildhalls of the Grand Place: The Town Hall of the city of Brussels is the most iconic building within La Grand-Place, Brussels. It is a Gothic building that was built during the Middle Ages. The façade of the famous town hall consists of statues depicting saints, allegorical figures, and nobles. However, the statues that are currently on this building are not the original statues anymore. 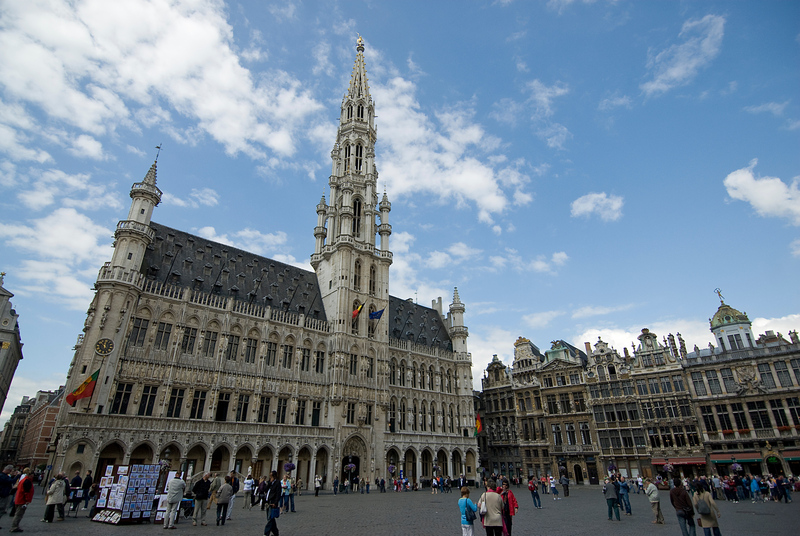 Today, La Grand-Place, Brussels is one of Belgium’s most popular tourist attractions. Tourists visit this spot all year round. It is also the site of the bi-annual Flower Carpet event in Belgium. Every two years in August, the Grand Place is home to an enormous flower carpet that is set up for a few days within the central square. There are over a million begonias that are set up in a colorful display of various patterns covering a total area of 24 x 77 meters. The first ever Flower Carpet was inaugurated in 1971 and the tradition continued due to its popularity. In fact, this event attracts a huge number of tourists in the square. Beautiful – both the monuments as well as the perspective. I love this square. Especially the light show in the evening.